Whether you’re hauling hay outside of Greeley or commuting to a job site in Longmont, the Honda Ridgeline has the towing power and cargo capacity for any sized job. With its excellent handling and suspension, you might encounter a bump in your project, but you’ll never feel the bumps in the road. Visit Northern Colorado’s leading Honda dealership today to see the new Ridgeline for yourself! Housed within the unique unibody design, the Honda Ridgeline is powered by a massive 280-horsepower, 3.5-liter V-6 engine. When paired with the six-speed automatic transmission, this mid-size truck provides an unrivaled driving experience, offering stability on even the worst of road surfaces. With a responsive and reliable gas pedal and smooth steering, you’ll find navigating the job site is a cinch in the Ridgeline. No matter the size of the pickup truck, storage is always the main selling point. When it comes to the Ridgeline, there’s plenty to talk about when discussing storage options. Unlike its competitors, this truck gives you a few options for loading up the bed. The tailgate flips down or swings open offering you easy access to the cargo bed. The lay-flat bed also features a lockable in-bed trunk so you can store important materials in an easily accessible area. The sizable truck bed is big enough to hold 4-by-8 foot wide sheets of material. Need more room? Hitch a trailer and carry up to a maximum of 5,000 pounds behind you, the Ridgeline can tow your equipment wherever you need it most. Within the cabin, you’ll find pockets and spots for day-to-day essentials like clipboards, drinks, snacks, and more. The rugged exterior of the Honda Ridgeline betrays the surprisingly comfortable interior. Take a look inside the crew cab and you’ll find five seats with padding and support to make even the longest rides more comfortable. 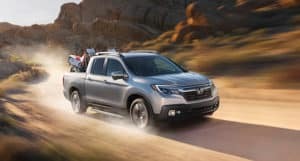 The passengers in the second-row are treated to plenty of legroom, as the Ridgeline offers more cabin space than any other midsize crew cab truck. The second-row seats can be flipped up to offer additional storage space for those specialty items that you don’t want to leave in the bed. If passengers are traveling with you, they’ll still have plenty of space to store their goods under the backseat as well. The roomy cabin is easy to get in and out of, thanks to the Ridgeline’s large doors. After you’ve worked hard, it’s time to play just as hard. The Honda Ridgeline has got you covered, with its suite of technological features and functions. Outfit the bed with speakers for a party-ready ride, then connect your smartphone to the 8-inch touchscreen through either Apple CarPlay or Android Auto. 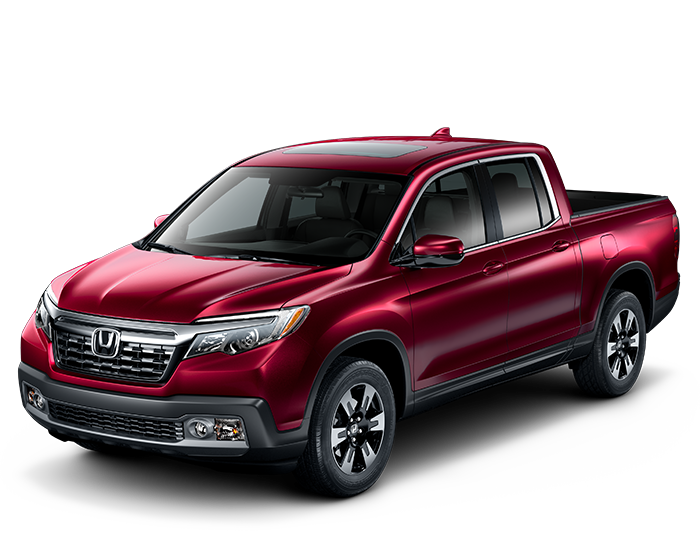 The available Honda Sensing driver aids like automated emergency braking, lane-keeping assist, and adaptive cruise control make it easy to drive this mid-size truck safely and securely. If you’re raising cattle outside of Greeley or working the farm in Wellington, or even if you need a capable gear hauler for your adventures around Loveland, the Honda Ridgeline is just the truck for your needs. The Markley Motors Honda dealership is excited to show you more about this powerful pickup. Meet with our sales consultants today to find out more about our extensive financing opportunities, and see our on-site automotive repair and glass shop. 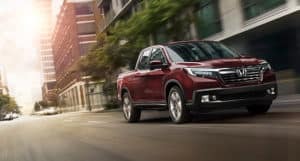 Contact us today to ask about pricing and availability of the 2019 Honda Ridgeline.